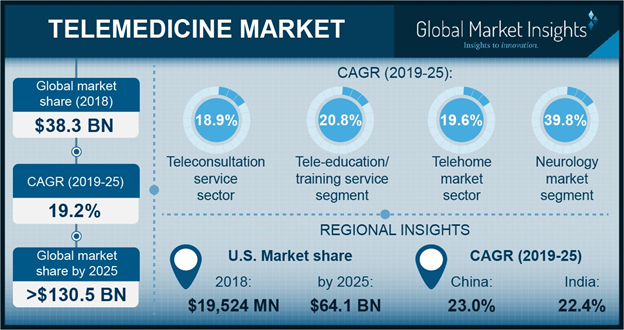 Telemedicine Market size is set to exceed USD 130.5 billion by 2025; according to a new research report by Global Market Insights. Growing telecommunications network and integration of healthcare and IT sector will boost the growth of global market across the forecast timeframe. As per Pew Research Center statistics, in U.S. mobile phone and smart phone penetration have reached 95% in the year 2018. Increasing number of smart phone users along with development of telecommunication network will drive the market growth in the future. Various government initiatives to provide healthcare services to population having limited or no access to healthcare services will drive global market. For instance, European Union launched European Patient Smart Open Services (epSOS) project for development of telemedicine services across all the member states. This project was aimed for developing advanced telehealth framework for patients that have limited access to healthcare services. Favorable government policies for supporting expansion of healthcare IT infrastructure will drive telemedicine market in the upcoming years. However, lack of awareness regarding the use of telemedicine in developing economies will impede industry expansion. Furthermore, absence of reimbursement for some or all telemedicine services will hinder market growth in the future. Teleconsultation service market is expected to grow at 18.9% CAGR across the forecast timeframe. High growth rate is attributable to increasing patient outcomes, reduced cost of healthcare consultation and improvement in quality of diagnosis. With increasing number of people adopting telemedicine services, the industry should witness considerable growth over the coming years. Telehospital market is forecasted to reach USD 85.3 billion by 2025. Telehospital business is poised to witness high growth across the globe owing to growing telecommunication infrastructure. Telehospitals provide virtual hospitalist presence in rural hospitals that are unable to support full-time on-site physician. Moreover, rising exchange of knowledge among healthcare providers will further boost telehospitals business. Application of telemedicine in dermatological diseases is expected to reach USD 30.7 billion by 2025. High growth rate is credited to elimination of personal visit to healthcare settings for diagnosis of various skin conditions such as rash, mole, or other skin issues. Using telemedicine for dermatological consultations saves both time and cost, thus leading to industry growth. Telemedicine companies are focusing on development of web and mobile based applications and platforms for patients. This trend will witness stable growth as increasing number of population in developing economies are becoming mobile phone and smart phone users. Developing telecommunications network will serve as major factor for growth of web and mobile based telemedicine platforms. U.S. market is expected to reach USD 64.1 billion by 2025. Presence of large number of mobile phone and smart phone users couples with well-developed telecommunications network is expected to boost market growth. Furthermore, increasing government initiatives for reimbursement of telemedicine services is expected to augment market growth in the future. Indian telemedicine market is forecasted to grow at 22.4% CAGR across the forecast timeframe. Telemedicine services enables patients in remote areas to save travel time and cost for consulting a healthcare professional. Moreover, various government initiatives and policies such as Ayushman Bharat Scheme will further lead to market growth in the region. Some of the leading industry players include Allscripts Healthcare Solutions Inc, AMD Global Telemedicine, BioTelemetry, Cerner Corporation, Cisco Systems, Honeywell International Inc, InTouch Technologies, Koninklijke Philips N.V., McKesson Corporation and OBS Medical,. The most commonly adopted business strategies by industry participants includes new product launches, regional expansion and mergers and acquisition.